I have attended a few different conferences, workshops and EdCamps lately where I have been introduced to an amazing amount of ideas and strategies related to instruction, technology and innovation. These sessions have been inspiring and excellent educational learning experiences. However, an underlying tone that has existed in some of the sessions I’ve attended has related to school culture. In technology sessions I’ve heard concerns about trust and support. In curriculum or instruction sessions I’ve heard teachers express concern about not feeling safe to take risks or not having autonomy in their classroom to try new things. These concerns relate back to school culture. If we do not focus on a positive school culture first, attempts to lead change or incorporate innovative ideas and technology become that much more difficult, if not impossible. There are too many schools that constantly shove new initiatives and ideas onto teachers while simultaneously destroying the culture of the school. School leaders are so caught up with doing what they feel is urgent, like incorporating the latest tech, or introducing new programs to address test scores, they miss what is important and crucial, which is school culture. As leaders, we need to get our school culture in a good place before trying to lead change in other areas. Admittedly, I have not always been perfect in this area, and have learned a lot through my failures and experiences as a leader. However, I have seen the positive effects of making school culture a central focus (see my previous post). The challenge for me has been maintaining a balance between keeping school culture a central focus, but at the same time, incorporating some new ideas and strategies. 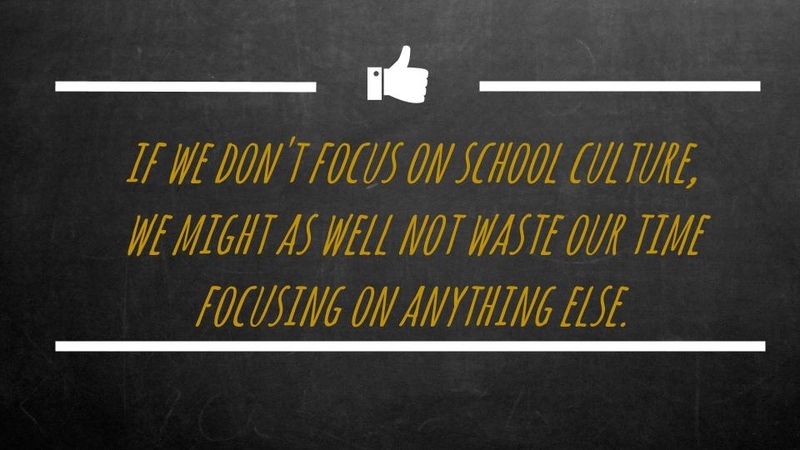 So why isn’t there more of a focus on school culture? At conferences and EdCamps, why are there dozens of PD sessions on the latest Apps and Google tools (all of which are awesome), but little to no sessions or focus on school culture? I was recently asked by a participant in a school culture session I facilitated “How much of your administrative coursework was focused on building school culture?” My honest answer was “ZERO!” I am certain there are institutions and programs that address school culture, but how many make it a focus? How many programs communicate to leaders that building a positive school culture is the key to school improvement? We need to see more sessions at EdCamps, conferences and professional development sessions that focus on how teachers and leaders can build a positive school culture. We need more teacher and administrator preparation programs make school culture a central focus. In Todd Whitaker and Steve Gruenert’s book School Culture Rewired, they write “Culture represents the unwritten mission of the school – it tells students and staff why they are there” (pg. 30). School culture is the central component of a school, it exists in some form – good or bad, and impacts everything within a school. We need leaders at the district and building levels to make improving school culture a top priority.